The Second National Frozen Yogurt Shop Owner Survey asked frozen yogurt shop owners in the US about operational practices, shop and owner characteristics, supplier satisfaction, concerns, and shop performance. LOS ANGELES - Nov. 20, 2018 - PRLog -- Last September, the International Frozen Yogurt Association launched the Second National Frozen Yogurt Shop Owner Survey. 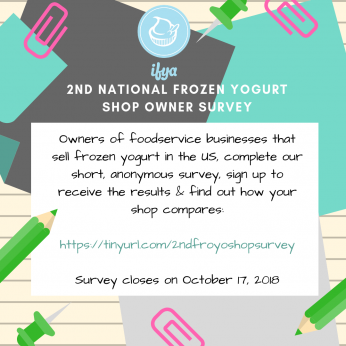 The anonymous online survey asked frozen yogurt shop owners in the US about operational practices, shop and owner characteristics, supplier satisfaction, concerns, and shop performance. The 2018 findings were very similar to the 2017 findings. Survey respondents were optimistic about the future of their business, though they were concerned about rising costs, finding and keeping good employees, finding new customers, and the seasonality of frozen yogurt demand. They were also fairly satisfied with their suppliers, especially their soft serve mix suppliers. Two new questions were added at the request of last year's respondents. The questions concerned sampling policies and seasonal hours. Sixty-five responses were received from frozen yogurt shop owners. Responses were received from shops located in 20 states, with the most responses from California (12.1%), Michigan (8.6%) and North Carolina (8.6%). A limited set of results is available for IFYA members in the members only Resources section of IFYA's website.